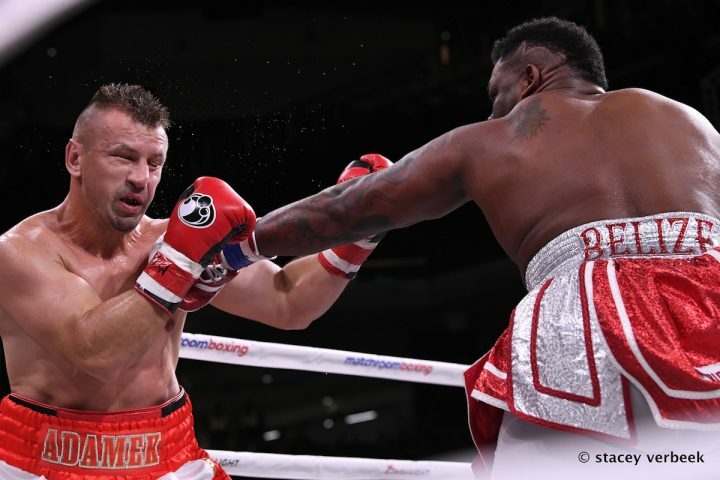 By Tim Royner: Jarrell ‘Big Baby’ Miller says he’s got a “50-50” chance of challenging IBF/WBA/WBO heavyweight champion Anthony Joshua for his titles in 2019 at Madison Square Garden in New York. Miller (23-0-1, 20 KOs) is signed with the same promoter as Joshua (22-0, 21 KOs), and he believes that the two of them could face each next summer in New York. Joshua’s promoter Eddie Hearn wants to increase his popularity in the United States, and one he feels he can accomplish that goal is to match him against the 315 pound Miller. It’s a way of increasing Joshua’s popularity without putting him in risky fights against the like of WBC champion Deontay ‘Bronze Bomber’ Wilder and Luis ‘King Kong’ Ortiz. Those two would be arguably be more of a threat to Joshua than the slow moving Miller, who is easy to hit. Miller, 30, will be at ringside this Saturday night for the Dillian Whyte vs. Derek Chisora II rematch on Sky Sports Box Office at the O2 Arena in London, England. Miller will be talking with his promoter Hearn during the fight card about the possibility of him facing Joshua in 2019 in New York. “I think June, July…would be the greatest time for me, just because I want to give myself enough time to prepare for that fight,” Miller said to skysports.com about a fight between him and Joshua. “I would say 50-50,” Miller said about his chances of getting the fight against Joshua in 2019. The 6’4″ Miller will be fighting next month on January 18 against an opponent still to be determined at Madison Square Garden in New York. It’s supposed to be #1 WBA Trevor Bryan (20-0, 14 KOs). It’s not known at this time if the WBA ‘regular’ heavyweight title will be on the line or not at that time. Hearn is hoping Miller will be fighting for the World Boxing Association title, but it’ll be up to the WBA. Miller wants to make sure he gets that fight out of the way before he looks to schedule a title shot against Joshua, which he hopes will be in the summer. That would be hard on Joshua if he has to get back in the ring two months after his April 13 fight. Unless Joshua destroys his opponent in April, he’ll require time to rest before he starts training camp for his next opponent, be it Miller or anyone else. It’s important for Miller that he wins his fight on January 18 and he looks good in doing so. Hearn has been putting Miller in showcase fights recently in matching him against Bogdan Dinu, Mariusz Wach, Tomasz Adamek and Johann Duhaupas. Those are guys that aren’t cutting edge heavyweights, and that’s made it easy for Miller to dominate them. Hearn is going to need to keep up that kind of match-making for Miller in his fight on January 18. If he matches him against someone a little too good, he could lose. Gerald Washington almost knocked Miller out in the 5th round last year in their fight in July 2017. Washington hurt Miller with a flurry of shots that had him ready to be stopped, but he gassed out and was unable to get his second wind. A good heavyweight with stamina likely would have stopped Miller if they were in the same position Washington was in. Joshua wants a fight against Wilder for April 13, but he realizes that fight will be hard to make for that date. That’s why Joshua will be attending the Whyte vs. Chisora rematch on Saturday. He wants to scout out those two because he could wind up facing the winner. Whyte still hasn’t locked down his rematch with Joshua for April 13. Whyte needs to take care of business against Chisora before he can have a chance of fighting Joshua on that date. Even if Whyte wins on Saturday, there’s no guarantee that he’ll get the fight with Joshua. Miller thinks that Joshua has gotten excited recently about wanting to fight at Madison Square Garden after attending the Saul Canelo Alvarez vs. Rocky Fielding fight this month on December 15. MSG was packed with Canelo’s boxing fans, and they were screaming like mad. Joshua vs. Miller might not sellout Madison Square Garden though, as neither of them are big names in the United States. Miller has some fans in New York, but he’s not a huge star like guys from the past like Miguel Cotto. Miller would like to fight Dillian Whyte in the future. Obviously, that would be a fight that would need to wait until both guys fight Joshua. Miller isn’t going to fight Whyte until after he faces Joshua. There would be too much risk involved for Miller in facing Whyte. The same goes for Whyte. He would be taking a huge risk if he had to fight Miller before he fought Joshua. A fight between Miller and Whyte is a given in the future. Once both of them face Joshua, it’s a natural to be made. It would be a good rebuilding fight for both of them after they likely lose to Joshua. It won’t be the end of the world for Whyte and Miller if/when they lose to Joshua, since Hearn likes to do rematches involving his beaten fighters. Look at Whyte as a prime example. He’s getting a rematch against Joshua even thought he was knocked out by him in the 7th round in 2015. There was one-sided aside from one hard left hand that whyte hit Joshua with in the 2nd round that hurt him. For the time being, Miller needs to make sure he doesn’t get tripped up by Trevor Bryan on January 18. A loss for Miller would make it hard for Hearn to justify a Joshua-Miller fight. It would still happen obviously, but Hearn would need to put Miller in with another handful of older heavyweights like the ones that he’s been feeding to him in the last couple of years. Miller’s dream of a title shot against Joshua would be delayed until Hearn could ramp him up again. It’s hard to know how well Miller will do against Bryan, considering how little is known about him. Bryan is an unknown for the most part. If he’s got some talent, then he could be a problem for Miller. That would be Miller and Hearn’s worst nightmare. For Hearn to be interested in matching Miller against Bryan, he likely scouted him out sufficiently to deem him a non-threat and worthy of putting ‘Big Baby’ in with him. Hearn wouldn’t put Miller in with Bryan if he didn’t think he could wind the fight. Miller has gotten so big lately with his weight at 315 pounds, it makes him vulnerable against anyone with hand speed, power and talent.